This paper analyses the contribution of immigration, trade and FDI to wage inequality of native workers in a sample of old and new EU Member States between 2008 and 2013. Methodologically, we use the regression-based Shapley value decomposition approach of Shorrocks (2013) to filter out their relative importance. We find that globalisation has very mixed effects and generally contributes little to wage inequality. 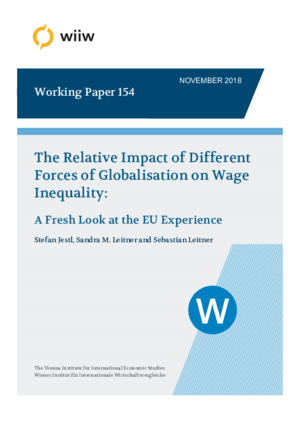 Regarding their relative contributions, immigration and FDI are key contributors to wage inequality in old EU Member States, while trade is the key source of wage inequality in new EU Member States. For immigration, the associated increase in wage inequality is strongest and most consistent among Southern EU Member States. We also show that immigration, trade and FDI have different effects across the wage distribution that are however strongest at its centre. For trade and FDI, we also find sporadic inequality-reducing effects that are strongest at the top of the wage distribution.